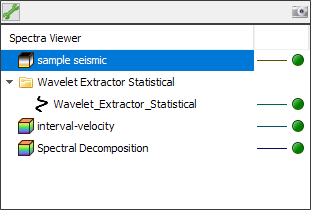 The Spectral Analysis window generates frequency vs. amplitude spectra for 2D, 3D, gather and wavelet data. Note: The Spectra Analysis tool does NOT operate on depth volumes. Convert depth data to time before analysis using Time/Depth Conversion. 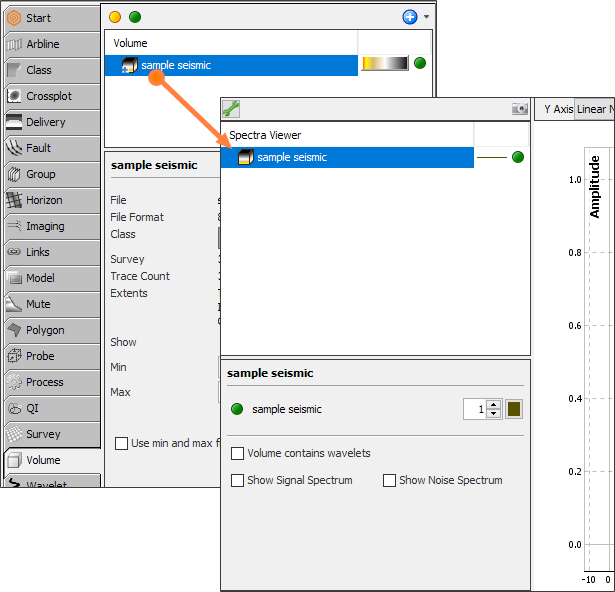 From tabs in the Control Panel, drag volumes or wavelets into the Spectra Viewer panel. In the Control Panel tab, right-click on a volume or wavelet and select “Send to Spectra Analyser”. The option is only available for data in the time-domain. The data for analysis is included in the Spectral Analysis tree. Note: Because a wavelet product can contain several wavelets, wavelets are shown as folders.